Lapland is situated over 4 countries : Norway, Sweden, Finland and Russia. 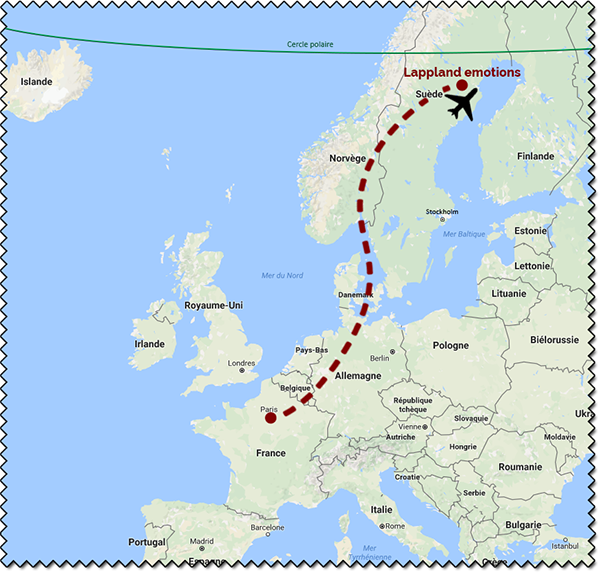 We are located in Svansele, in the Swedish Lapland, very close to the artic circle. It takes 3 hours flight from Paris to come to visit us! Our place is 5km away from any civilization, surrounded by the boreal forest. Down the property flows the Skelleftea River, well-known for its large fish population (more than 14 species). It’s a little calm paradise, from where you may have the chance to see the Northern lights in winter and the midnight sun during the summer! Originaly French citizens, we decided to come to Svansele with our huskies to change from our busy life. With our 3 children, Paul, Louise and Pierre we crossed Europe with our life to live our dream, “The call of the wild” as would say Jack London. Nature is wide, why coming to the Swedish Lapland? First of all, the school system is great and that is crucial, we wouldn’t have left degrading our children’ possibilities (and we actually extended them! ), and for the quality of life and its openness to foreigners. Lapland has the Europe’s last wild territories, between forest, lakes and rivers. This is the perfect place for our huskies, the climate is also more adapted for them than western Europe. Lapland has also a cultural side: The Same (reindeer stockbreeders). They are still very present in our daily life through their traditions and we try to share a maximum of this culture with our guests. This is who and where we are, waiting for you!